The Northern Ireland Office is extending its legal power to suspend the requirement to hold a fresh Assembly election by five months. The provision, contained in an act which became law in November, had been due to lapse next week. But the law gave Secretary of State Karen Bradley the ability to order a one-off extension. This means she is not required to call another Stormont election until after the end of August. Northern Ireland has been without an executive since January 2017, when the power-sharing parties - the DUP and Sinn Féin - split in a bitter row. 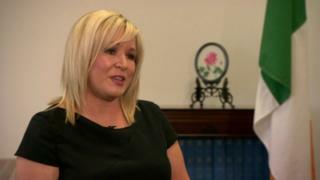 In an interview with BBC News NI, Sinn Féin Vice President Michelle O'Neill said Ms Bradley, told her she had taken the decision due to the current "uncertain" political situation. Ms O'Neill said it is her understanding there will be no concerted attempt to restore the power-sharing institutions until after the local government elections due in May. Ms O'Neill criticised the decision to extend the emergency power, claiming it is typical of the current government which, she says, is focussed only on Brexit, its own survival and its reliance on the DUP. Asked if Sinn Féin shared responsibility for the deadlock at Stormont, Ms O'Neill said her party had been prepared to talk, but claimed the DUP had "only got the band width" to deal with their Westminster relationship with the Conservatives and that they have "switched off" to what is happening back at home. "I don't believe that they have tried in any shape or fashion to have a real and meaningful process," she said. "I don't believe they have tried in any shape or fashion in their role as co-guarantor of the Good Friday Agreement and the responsibility for rights to encourage the DUP into a space where they are actually up for doing some business and trying to restore the intuitions." The Northern Ireland Office has declined to comment on the Sinn Féin claims, but confirmed that Ms Bradley is planning to make an announcement on Thursday. Why did Stormont collapse in the first place? For almost 10 years, the DUP and Sinn Féin worked together in government under a system of mandatory coalition, where unionist and nationalist parties shared power. But in late 2016, a row developed over the DUP's handling of a flawed green energy scheme that could cost the taxpayer £490m: the Renewable Heat Incentive (RHI) scheme. 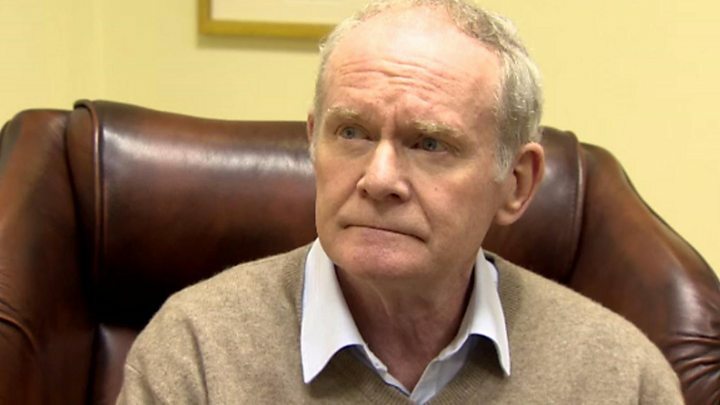 On 9 January 2017, Sinn Féin's Martin McGuinness resigned as deputy first minister, citing the DUP's conduct around RHI as the main reason. That meant DUP leader Arlene Foster lost her job as first minister and triggered the collapse of the Northern Ireland Assembly. After power sharing collapsed, then Northern Ireland Secretary James Brokenshire had to call a snap assembly election for 2 March 2017. The DUP and Sinn Féin were still returned as the two largest parties, but this time unionists had lost their overall majority in the assembly for the first time. All MLAs, new and returning, briefly attended the assembly chamber to pay tribute to Martin McGuinness when he died later that month. A talks process to try and enable a breakthrough began, but to no avail. There were several sticking points, but the main one has been Sinn Féin's call for a stand alone Irish language act, which it says would enshrine the rights of Irish speakers in Northern Ireland. But the DUP has always refused to budge on it, and in February 2018, when it looked like a deal was possible and Prime Minister Theresa May flew to Belfast, talks collapsed at the eleventh hour because of disagreement over the Irish language. Since then, Stormont has pretty much been in deep freeze, with no sign of thawing out. Because of the impact it has had on day-to-day governance. In the two years since Martin McGuinness resigned, there has been what Stormont officials describe as a "slow decay" across public services. Important decisions across all areas - health service, infrastructure, schools - have been effectively put on hold because there are no ministers in place to take them. Who's calling the shots on NI policy? There have been calls for direct rule from Westminster to be brought in again, but the British government has been unwilling to take that action. Instead, it passed legislation last year to give Stormont's unelected civil servants more legal clarity to make decisions in the absence of ministers, until the parties can reach agreement. Is Karen Bradley running out of road?